Right now, as I write this, I’m sitting in a tent. Right now I’m somewhere on the Northern coast of Spain. Right now, the thick fog has lolloped in off the Atlantic and licked everything with sticky warmth. And right now, the couple in the tent next to me are playing, on their stereo, a variety of songs of their choosing. This is one of the many dangers of camping, of course – the cobweb-thin tent walls leave you compellingly at the mercy of your neighbours’ noisy wills and this, otherwise likable couple, is their music. I have never been a fan of The Killers, and have studiously, obsessively avoided hearing their music, but now I’m trapped in a hellish mock-rock cell of my own making. At least, having now been force-fed all their albums, I can truly say that I have a new all-time least favourite song. I don’t know what it’s called, but the chorus drones the same woeful flash of enlightenment over and over – ‘It’s Indie Rock ‘n’ Roll for me’. As a sentiment, this is so incredibly trite and banal all at once that perhaps Brandon Flowers deserves a medal of sorts. I can think of nothing less ‘Indie Rock ‘n’ Roll’ than exactly and specifically that line – and I speak as someone who once saw Travis live in concert (by mistake – long story). How anyone could maintain any musical credibility after penning a line like that is beyond me, but such is the will-sapping nature of mainstream rock sometimes. I used to think that music tastes on the continent were a bit safe – and it’s true that U2 (or Ooh-Dos as they’re called here) are horribly omnipotent – but actually I think they’re as bland as they are back home. Music here is just bone-headedly dull in a whole new way. Aside from vast swathes of generic rock, which could simply be foreign language versions of any Kooks B-side, is the wonderful, stupidly-skewed Euro-pop, which continues to delight and madden just as much as ever. The songs literally all sound the same, and the only distinguishing features are slight variations between the deceptively complex hi-hat/kick-drum/bouncy-bassline slurry, are the manically stupid vocals. I heard two – two – separate groups of teenage schoolgirls singing the hook of one offender – “I wanna take you dance, dance, dance in the disco/Oh aye-aye, oh aye-aye/ I wanna take you from Paris to San Francisco/ Oh Aye-aye, oh aye-aye” – the other day. This song, which I subsequently heard on Crud FM, and is now welded to my brain, is only beaten in the banality stakes by another, which repeats, monstrously, “I wanna take a ride in your discotheque“, until you start weeping blood. (Please note that it is not the Lady Gaga song about disco sticks, but is it’s very own awful, altered beast.) They may have both been written by the same evil genius for all I know. And the point is? Well, the point is that I’d crawl over hot, Swine-flu-infected shards of glass to listen to those songs back to back for a day – hell, two day – than ever hear that Killers song ever, ever again. 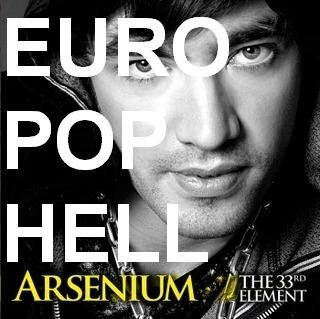 Until then, here’s that Euro-disco song, by someone called, unbelievably, Arsenium, to drive you mad, too. And I insist you do listen. Your life will be the better for it. Posted on July 6, 2009 by Joe Sparrow. This entry was posted in Today's New Band and tagged ANBAD on tour, Euro Pop. Bookmark the permalink. >Inevitable End Of Year List #1, Part 2 – Delayed By Phlegm | A New Band A Day!